One of the biggest reasons that I push Twitter on to ever teacher I meet is that I find that it has so many benefits in my own personal growth as an educator. One of the prime examples of that is when I want to be at an educational conference but can not go due to time or budget constraints. This week I am following the Florida ed tech conference and am learning a lot that I can use now and some that I will keep for later. Find the hashtag for the conference, the hashtag will be in the format of #______. Use Tweetdeck in a Chrome browser to easily see different hashtag searches. This helps you to easily follow multiple subjects and then easily allows you to connect with those at the conference. A conference is perfect time to find new people to follow on Twitter. Find those posts that you really like and follow those people. Often times if you start following someone, they may follow you which will create a new opportunity to make a connection. You can use a ifttt recipe to save your favorite tweets to something like Evernote or a Google Doc or Spreadsheet. Unfortunately once there are a lot of people tweeting out using the same hashtag the spam bots will show up. These are automated programs that send out tweets using the most popular hashtags at the time that will also include links which often lead you to a virus riddled site. 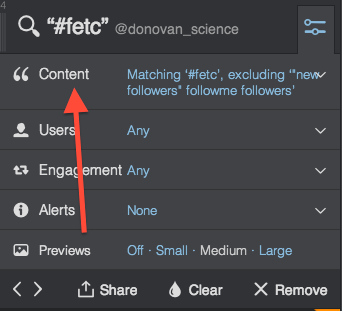 If you are in Tweetdeck, you can easily filter out the common words that the spam bots are using so that you can remove them from your timeline. Click the button next to the hashtag you are searching. 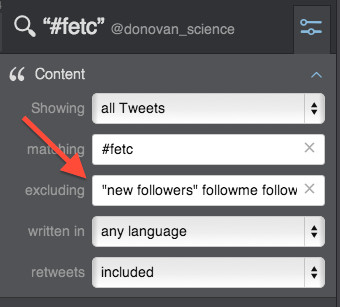 Add the common words you are seeing in the spam tweets into the “Excluding” box. Typically you will see “new followers” as a common term to filter.